With premium leather and a breathable upper, the Moloa Kohana's deconstructed look defines casual style. Elastic gore fit panel, hand-sewn stitching, embossed logo detail, and Kohana signature red outsole hook logo. Due to the nature of the fit, we recommend ordering a half size down. All-weather rubber outsole with full-grain leather foxing and non-marking rubber traction pods. 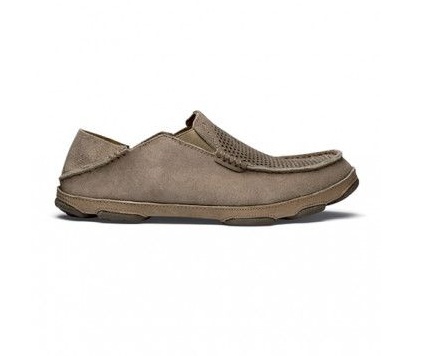 Dual-density anatomical PU footbed with polyurethane gel insert and a natural cork cover. Removable. 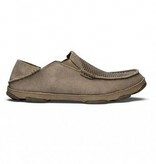 Our Versatile Drop­-In Heel® offers both a shoe and slide functionality. Our thermoset rubber is a compound of natural and synthetic rubber that will not leave marks or ‘scuffs’ on surfaces of any type. Our gum rubber outsoles, as a natural material, will always naturally be non-marking.